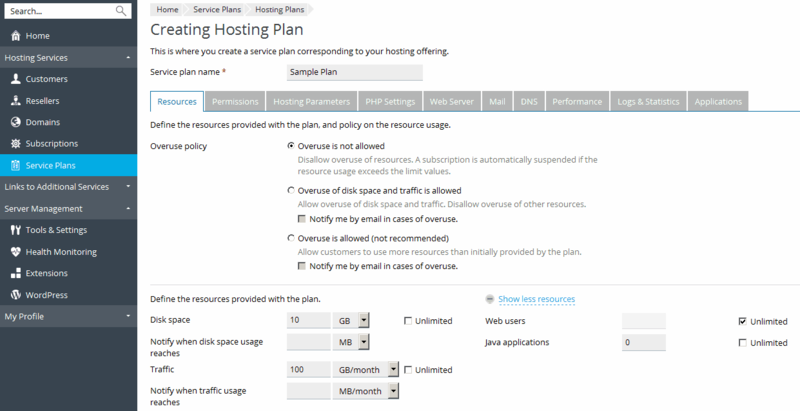 To create a hosting service plan in Plesk, run the Service Plans > Add a Plan wizard in the Server Administration Panel. During the plan creation process, you will be prompted to specify various plan parameters. Learn more next in this section. If you already have service plans and want to create plans with similar settings, you can create copies of these plans by clicking Clone Plans on the Service Plans page and then edit the copies as described in this section. Once the plan has been created, you are ready to start serving your customers. In other words, you can create customer accounts and subscriptions. Learn more in the section Subscribing Customers to Plans.